I only received your letter of the 11th May last on the 26th Inst. and was glad to find you were all well. 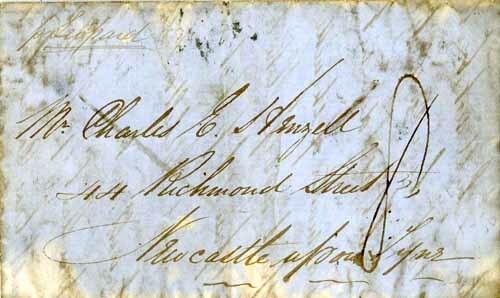 I have not yet got the letters you mention from my Mother & Bess but presume they will arrive ere long. From your long silence I imagined I was forgot and therefore came to the determination of not writing any more especially when I am not in the best of spirits from the blackguard conduct of Mr J. G. after persuading me to come out and promising his support after my settling his affairs with his nephew he finds the markets getting bad, sends little or no Goods & finishes the affair by forwarding a power of Attorney to another party & wants to make me responsible for all losses and expences. I never was more deceived in any man & the paltry excuse he makes is that I did not keep him sufficiently advised (altho’ I always wrote 2 to 3 times p. month) and was not sufficiently quick with Remittances—the whole fact of the matter is, that finding the market here is (in) such a miserable state & fearing getting involved with other parties whom he persuaded to ship Goods & knowing I had no Capital he thought it more prudent to throw me on the world than sacrifice himself. The various Goods I handed over to the parties here we sold by auction & actually did not bring within 30% of the first cost in England and business here at present is worse than ever. Two of the provinces have risen against General Rosas & joined the Brazilians against this province & the first exchange of shots took place about 5 days ago & there is no saying what will be the end of it. I cannot give you any information with regard as to what I shall do further than I will not return to England but wait patiently to see what turns up. I did not send any newspapers by the last two packets as I was staying about 56 miles in the country & will most probably go out again in about 10 days hence to stop for a month or two. I received the newspaper containing the announcement of Bessy B’s marriage with Mr. James Macmeikan whom I know personally. The only thing which appears strange is the [that] J. Hodgson should have been the party selected to give her away. I expected to have received cards but as they did not think fit to send them I shall not break my heart about it. I should most certainly have congratulated her had she given me a chance but as I did not receive any official intimation, as a matter of etiquette I did not do so being of an independent spirit myself. I like to see it in others & care for no person’s friendship if it does not come from the heart. I am glad Isabella F. is about changing her name & I think she will make a very good wife. I am very sorry for my poor Aunt Gordon that her late son Robert’s misconduct must have caused her almost to be happy he is dead. I know of nothing more melancholy than when such is the case. I also see by your letter the death of Jos. Slater & J. Fell. I am not altogether astonished. The news about Conseil I fully anticipated from the fast manner in which he went on after his marriage. I am exceedingly sorry at what you mention about Jy. Smith there must have been something very wrong to have caused him to be imprisoned. It seems to me that all the young men of N’castle are going to the devil & I only rejoice I am out of it, altho’ not a stranger to misfortune. Two English vessels have arrived here within the last 2 months from N’castle and Bordeaux, viz. the “Crimea” & the “Arab”, both loaded by Jos. Sheild Son & Co. & no letters from you, this is too bad. P.S. I received 3 newspapers by last Packet & generally speaking get only one & sometimes not that. I ask you would simply put my name on the papers & Buenos Ayres. I am not yet sufficiently ambitious for [me] to be entitled Merchant.